Roll out the red carpet! 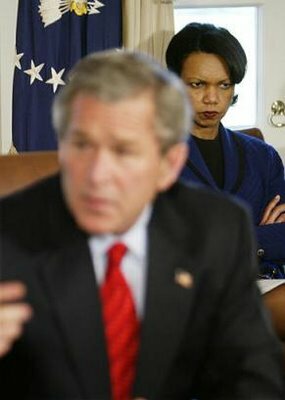 Condi's comin'. I was delighted to hear that my secretary of state will be visting Liverpool and Blackburn this week. When she's in Blackburn, I hope Jack Straw takes her to see the carpark on top of the council building, which has got to be one of the most inexplicably surreal places in Britain. But I imagine they'll tread the well-worn gladhanding trail from school to mosque to successful small business, in between dodging protesters. Yep, seems some people aren't as delighted as I am with Condi's visit. It's not every day we get one of the key players in the Bush administration up here and Northwest protesters are busy dreaming up witty Condi-specific placard slogans. The highlight of Condi's trip will almost certainly be a Liverpool Philharmonic concert in her honour hosted by Scouser celebs Roger McGough and Cathy Tyson. Except that - oops - McGough, Tyson and some of the musicians have decided to boycott the gig for political reasons. This was a marvelous piece of planning, because considering how well the capital of culture preparations are going, Liverpool could really use some more scandal and bad press. If the musicians won't behave, maybe they could get Condi to play - she is a concert pianist, though I imagine she doesn't get much time for tickling the ivories anymore. One blog has really gone above and beyond in keeping us up to date on all things Condi. Hats off to our own A Logical Voice, which remains the best place to go for updates about the story as they occur - here is their latest. You can also visit Condiwatch for details of protests Friday and Saturday. Anyone going? Nice story - I miss the NY Observer! She looks scary in that photo! That was a interesting article about Spike Lee as well. That documentary should be good! Rumours are flying that she is going to be Bush's successor.. Some people are talking think it might be a contest between Hilary (Clinton) and Condi! I hope not. I think Obama might have a shot.